(Photo: REUTERS / Baz Ratner)Pope Francis (seated 2nd R) listens to Israeli Prime Minister Benjamin Netanyahu speak as he sits next to Israeli President Shimon Peres during a ceremony in the Hall of Remembrance at the Yad Vashem Holocaust memorial in Jerusalem May 26, 2014. Francis, at the request of Prime Minister Benjamin Netanyahu, visited on Monday Israel's "Memorial to the Victims of Terror", a day after praying at an Israeli security wall abhorred by Palestinians. On a diplomatic quest in Israel, Pope Francis and the man many see as the leader of Eastern Orthodox Christians have prayed together inside the church where their faithful believe Jesus was crucified. Later he and the Ecumenical Patriarch of Constantinople, Barthomew, signed a signed a Common Declaration pledging to continue working for the unity of their churches which split in 1054. On Monday Pope Francis honored Jewish victims of the Holocaust and terrorist attacks in a visit to Jerusalem's Yad Vashem memorial. Francis prayed in front of a crypt containing ashes of victims and laid a wreath of yellow and white flowers in the Hall of Remembrance. The Argentine Pope then kissed the hands of a six Holocaust survivors and heard personal stories of loved ones killed by Nazis during World War II. Earlier Monday, the final of his three-day trip to the Holy Land, Pope Francis met the Grand Mufti of Jerusalem, Muhammed Hussein. "May no one abuse the name of God through violence! May we work together for justice and peace! Salaam!" said the Pope. Francis noted dialogue and exchange between Christians and Muslims which, he said "offers new strength to confront the common challenges before us." On his arrival by helicopter in Israel from the Palestinian territories on Sunday the Pope strongly condemned the shooting attack at a Jewish Museum in Brussels. Four people were killed when a gunman armed with a Kalashnikov assault rifle fired into the Brussels museum killing four people. Francis said he was deeply saddened by this "brutal" and "criminal attack of anti-Semitic hatred" and offered his prayers for the victims and wounded. The killing was also condemned by the general sectretary of the World Council of Churches, Rev. Olav Fykse Tveit who said, "This brutal attack on visitors to a museum paying tribute to the Jewish people and their history reflects the frightening and unacceptable increase of intolerance and violence against minorities in Europe." The Conference of European Churches also condemned the killings. 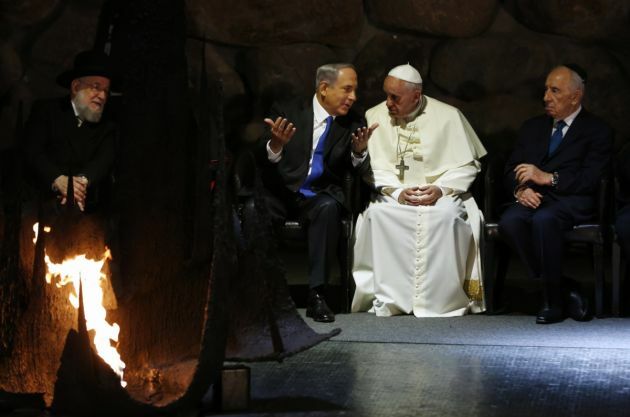 When he got to Tel Aviv the pontiff spoke about the quest for peace between Israel and the Palestinians. He reiterated that a "Two-State Solution" must become "reality and not remain merely a dream." At the end of his speech, the Pope renewed his invitation Israeli President Shimon Peres and Palestinian President Mahmoud Abbas to visit his home at the Vatican to pray for peace. News agencies reported that both had accepted the invitation. The Pope also planted an olive tree, a symbol of peace and prosperity at the Garden of Gethsemane, where the Gospel says Jesus prayed and slept the night before his crucifixion. Pope Paul VI had planted an olive tree half a century ago and the second was laid by Pope Francis on May 26 during his three day visit to the Holy Land. The two trees now stand side by side within the sacred enclosure next to a a centuries old olive grove.